In our last blog, we discussed some of the special occasions of which private transportation is a perfect addition. Some of the special occasions that we discussed were weddings, concerts, sporting events, casino nights, and wine tours. For each event, private transportation with a chauffeur is a great way to not only add a little extra magic to your already special event, but also keep your event goers safe and the party going all day or all night long. Silk Road Transportation & Wine Tours offers the highest quality chauffeurs and vehicles. If you are considering booking a wine tour with us or any other transportation, here are the vehicles and special offers available. Who doesn’t love a party bus? Our party buses come with a complimentary bottle of champagne and water and are outfitted with LED party lights, perimeter seats, a stellar sound system, a dance pole, and mini bar. Our party buses can seat 14 people and can be reserved for a 5 hour minimum. Also, we offer a 3 course gourmet picnic lunch as an option to be added to you day. The cost is $19.95 per person. Keep the party vibes going all night with our party bus that will have your party goers dancing and smiling all night long. Our Mercedes Sprinter also seats 14 people as well and is a great option when you need to take the whole crew with you on your next excursion. We also offer a 3-course gourmet picnic lunch for $19.95 as an additional part of your private transportation experience. We ask a 5-hour minimum. Book a wine tour and take all your friends along and ride in one of our premier Mercedes Sprinter. Who has ever turned down a ride in a limo? A limo can not only make a special event even more special and can also be a convenient and practical choice for those needing to take a large party anywhere. Our limos seat up to 8 people and your limo reservation includes a complimentary bottle of champagne and water. We also offer our 3-course gourmet lunch with all of our limo reservations and our limos must be reserved for a minimum of 5 hours. Take a limo with any wine tour or reserve one for your next big event. We also offer a Suburban LTZ that can seat up to 6 people. Our Suburbans are spacious and comfortable. Your Suburban reservation includes complimentary water and you can purchase a picnic lunch with this option, as well. 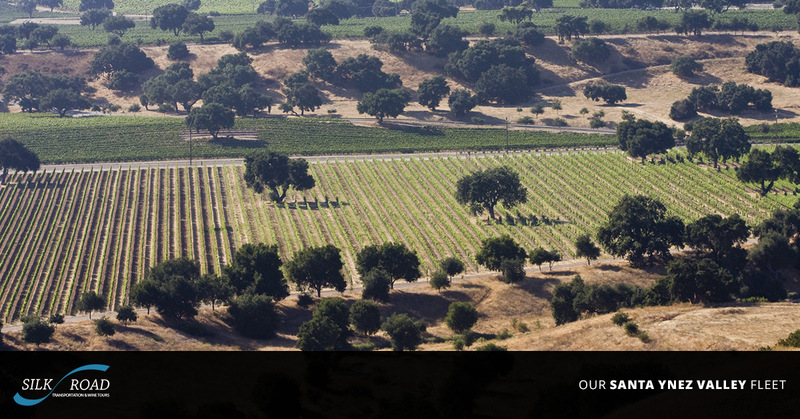 If you are looking for a comfortable private transportation option for your next wine tour in the Santa Ynez Valley or surrounding areas, book a Suburban LTZ with us. Our chauffeured town cars are a perfect choice when you have a small party. Our town cars seat 3 people and include water and you can add a gourmet picnic lunch to this option as well. We require you to book our town car for a five-hour minimum and, as we promise with all of our private transportation options, you will be blown away not only with the quality of our service, but also the cleanliness of all of our vehicles. Book with us for your next big event or wine tour in Santa Ynez Valley!